University College Galway: The only Irish university to move up in the recent QS rankings. 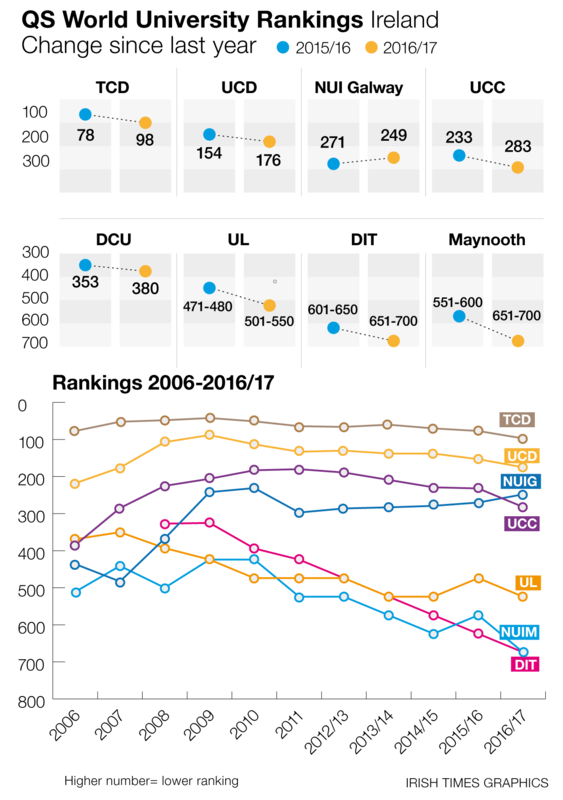 The significant change in the positions of most Irish universities in recent years in the QS ranking of world universities is causing alarm in some quarters. The latest rankings have seen further falls, with Ireland’s top-ranked university, Trinity College, now just ranked inside the top 100. Whether we like it or not, these rankings do matter, if only because they may influence the choice of academics and researchers concerning where to work, and the choice of students, in particular graduate students, with regard to study location. Besides, universities give these rankings considerable prominence in promotional material and websites, especially when the rankings move in their favour. There are some things to keep in mind when looking at the rankings. First, it appears that there is a strong bias in the QS rankings favouring Ireland. For example, of the top 30 universities using the recent QS ranking, 24 are in the English-speaking world. Is it really believable that Britain has nine universities in the top 50 whereas developed countries of similar economic size and maturity such as France and Germany have just one or none? Other rankings, for example, based solely on more reliable research measures have France and Germany figuring as prominently as the UK. There could then be an inevitable drop in rankings for the English-language countries, including Ireland, in years to come. Add to this the rise of Asian economies and universities, and even bigger declines could be predicted. Thus, large jumps up and down the present annual rankings are very possible, especially given the subjective nature of these rankings. Reputation accounts for 40 per cent of the total QS “score”. Reputation can be a notoriously fickle concept. Changes in reputation can easily drive large changes in ranking in either direction. We are not talking here about clear objective measurement as for golf or tennis or football world rankings. The third point to make is to advocate caution with regard to explanations for variations in rankings. There may, for example, be too much of a readiness in Ireland to attribute a fall in ranking primarily to a drop in public funding. If so, how then can the very low ranking of some French and German universities be explained? Besides, it is the relative movements in public funding that matter. Many British universities had cuts in public funding in recent years but still moved up in the rankings. How do you explain within the Irish context the rise of UCG in the recent rankings? Universities should also look critically at their own operation, for example pay levels relative to other countries, the system of incentives linked to academic performance and academic structures. Before granting increased funding to any part of the public sector, the Government, on behalf of taxpayers, must be assured that maximum value for money is being obtained from existing funding. There is a lot of evidence to show that it is not just money that matters in educational performance at all levels. For example, in the US expenditure per student is way above the OECD average for primary and secondary education but it ranks well below average in terms of student performance. A further question is what should be the target range for the ranking of Irish universities? That depends fundamentally on the number of universities we wish to support. It is probably totally unrealistic to expect more than one or two Irish universities to be ranked in the top 250 in the world. This is given not just the small size of the country but the relatively large number of universities here. Related to this, would it make more sense to target success in different subject areas, such as, say, the natural sciences in one university and engineering in another? Such issues raise fundamental questions for future policy towards third-level education in Ireland. The significant fall in the reported ranking of Ireland’s top two universities in the last few years means that these questions cannot be ignored.